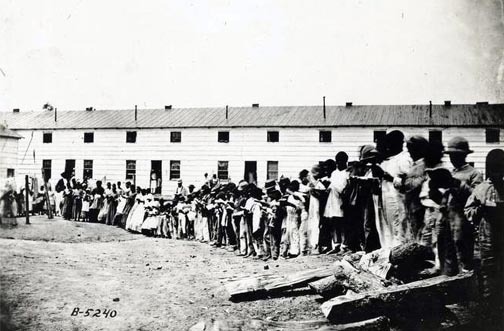 Young scholars at Prince Street Barracks, Alexandria, 1863-1864. The Friends of Freedmen’s Cemetery was founded in 1997 for the purposes of preserving, commemorating and researching a little-known Civil War-era African-American burying ground in Old Town Alexandria. Lillie Finklea and Louise Massoud were the founding members, and they and Tim Dennee, Char McCargo Bah, Shellyn McCaffrey and Ludwig Gaines made up the original volunteer board of directors of the 501(c)(3) non-profit organization. The Friends initially concentrated on memorial ceremonies to honor Alexandria’s freedpeople and to raise public awareness of the location and condition of the forgotten cemetery. In 1999-2000, we produced a brochure on its history and helped prepare an exhibit at the Alexandria Black History Museum. At the same time, we obtained a Virginia highway marker for the site. Until 2007 the cemetery was concealed beneath a mid-twentieth-century gas station and office building, but these have been razed for the creation of a public commemorative park. In a moving ceremony on May 12, 2007 the cemetery was re-dedicated. On September 6, 2014, hundreds of descendants and friends convened at the newly completed park for a ribbon-cutting, speeches and song, and dedication of the beautiful memorial sculptures by Joanna Blake and Mario Chiodo. It was a moment we could hardly have dreamed of when we set out. The park came about by the construction of a new Woodrow Wilson Bridge across the Potomac River. As the project used federal highway funds, it was necessary to mitigate potential harm to nearby historic properties. Immediately adjacent to the Interstate 95 right-of-way, there was the potential for the cemetery to be harmed physically or by noise and visual intrusion. Mitigation funds paid for much of the preparatory archaeological work and for construction of the park infrastructure and memorials. Archaeological work actually began in 1996 and 1998, with ground-penetrating radar and electromagnetic surveys in front of the gas station and along the southern and western edges of the site. Grave shafts were exposed at these edges in 1999-2000. Additional graves were located in 2004, and after the City of Alexandria acquired the property in 2007, the buildings were leveled, and the most extensive investigations began. It was never the intent to excavate the graves, but artifacts were recovered where the ground had previously been eroded or re-graded. Items found include coffin hardware, buttons, ceramics, and dropped Civil War bullets. One grave had surface decoration of oyster shells, an African-American burial practice. Indian lithics, predating the cemetery by millennia, were also unearthed. Most important, archaeology illustrated the burying ground’s layout. It was at least 46 rows deep, and about 50 graves across north to south. In all, 534 graves were identified, and it is estimated that 900 remain of the more than 1,700 original burials dating from 1864 to 1869. Most coffins were hexagonal, and most held children. A twelve-foot-wide lane perpendicular to Washington Street divided the cemetery in two, allowing the burial parties to cart the coffins to the waiting graves. According to period records, the burying ground was bounded by a picket fence, and each grave was marked with a headboard. For their efforts to create the park, we would especially like to thank the Woodrow Wilson Bridge Project, the City of Alexandria—especially the City Council, Alexandria Archaeology, the Department of Parks and Recreation, and the Alexandria Black History Museum—and many of Alexandria’s churches and citizens. Today, Freedmen’s Cemetery is listed in the National Register of Historic Places, the Virginia Landmarks Register, and the National Underground Railroad Network to Freedom. 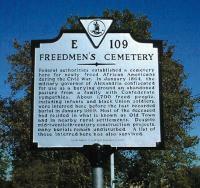 The main work of the Friends of Freedmen’s Cemetery being complete, the organization has effectively dissolved. This website remains, however, to honor the freedpeople of Alexandria and the Washington area. It is intended as a resource to present their stories and to connect them to their descendants and to area residents of today. It will be updated periodically with additional historical information, and we welcome contributions of material on the freedpeople, as well as data on the area’s African Americans of the eighteenth and nineteenth centuries.